The Youth Worker will need to travel monthly to London and will have a college supervisor in Penzance. 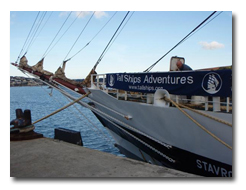 The Youth worker will also be invited to participate in Rank Tall Ships Challenges. JRT see this as an investment in young people on the Lizard, and a development of leadership skills in the Youth Worker. The job holder will be supporting existing youth provision, building on LOT’s experience and opening new doors of opportunity; as has been the case in the past, activities and projects will be open to all on a voluntary, non-paying basis. Updates on this project appear on the Youth page of this website. Details of the Youth or Adult? Initiative can be found on the JRT and Rank Foundation websites. Tall Ships voyages and Outward Bounds Expeditions will be offered annually to young people on the Lizard by the Rank Foundation, which also arranges annual conferences for line-managers and youth workers. The Youth Worker’s line-manager will be Maggie Roberts (trustee) with Vicky Allen and Tom Jane, both trustees, as assistants.